Robert Lambert’s Fruit Cake for sale. Buy online at Zingerman's Mail Order. Gourmet Gifts. Food Gifts. A cake of a different caliber. Full disclosure: the price on this cake may cause sticker shock. Where most fruit cakes are cheap, somewhat industrial and terrible, this is another species altogether. It's by far the best of its kind I've ever tried. This is Robert's classic cake. He explains, "The recipe is British, Victorian era. It's based on my grandmother Floria's cakes, but instead of the store-bought glaceed fruits she used, I make my own candied fruit." But though the original recipe is more than a century old, each year Robert tweaks it a little: he'll add a new, just-discovered rare citrus, or he'll adjust the way he's chopping the nuts or candying the fruit to make it a little more delicious, a little more beautiful, a little more show-stopping. That also means that, from one year to the next, the flavor of the cake will change just a smidge. For this year's cakes, Robert started by choosing citrus like blood oranges, bergamots, Rangpur limes, rare Japanese shekwasha, and more, many that he picked himself. He mixed them with cherries he glaceed in his own Blood Orange Syrup, and nuts hand-cut down to just the right size to distribute them evenly and help the cake stay intact when sliced. He soaked each cake in cognac and aged them for a few months. Then garnished each with a slice of candied lemon and a bay leaf, and gently wrapped them one by one in cheese cloth. A slice cut thin while the cake is cool—he recommends serving it chilled—looks like a stained glass window and tastes fresh, clean and lively. 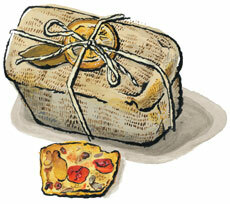 Each cake is about six inches long, comes in a muslin bag with a drawstring, and serves 8 to 10. "Extraordinary." "One of a kind."